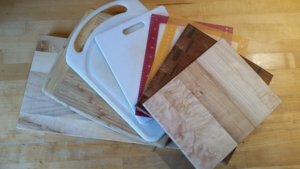 →Is There Any Advantage of a Wooden Cutting Board Over a Plastic Cutting Board? A cutting board is one essential item in your kitchen after the very much needed knife. It certainly is available in variety of materials. Some prefer plastic cutting boards, while some prefer bamboo cutting boards, while some are only comfortable with wooden cutting boards. However, there are pros and cons of all of them. One of the most important reasons for choosing a wooden cutting board in your kitchen is that the wooden cutting boards are known to kill bacteria. The same bacteria tend to grow on plastic cutting boards, while on wooden cutting boards they do not grow as much. Plastic cutting boards when new are free from bacteria but when used, the knife scars make it easy for bacteria to grow. A material like plastic does not seem to be porous and also it does not absorb liquids, but once it gets the knife scars it almost becomes nearly impossible to clean its surface. Even if you try cleaning a used plastic cutting board with bleach or by using a dishwasher it is extremely difficult to make it bacteria free. On the other hand both new and used wooden cutting boards have this ability to stop the growth of bacteria and also kill some bacteria on its surface. The bacteria which retain on the surface of the plastic cutting boards can cause a lot of diseases related to stomach infections. Wooden cutting boards on the other hand have antimicrobial properties. These wooden cutting boards surely make your food more secure to have as against the plastic cutting boards. Another advantage of wooden cutting boards over plastic cutting boards is that wood is completely biodegradable and also renewable unlike plastic which is non - biodegradable and also non - renewable. This is an important step for a better and greener environment. Plastic is an extremely hazardous material to use. Its use needs to be limited. When there is an option like wood, there is no reason to still use a plastic cutting board. The wooden cutting boards also have this one advantage that they protect your knives. They do not let your knives get dull. A wooden cutting board is usually seen to keep knives sharp for a longer time. This ensures that you can use your favorite knives for a longer duration. You also save on buying a new knife every now and then. Also, a wooden cutting board is said to be self - healing as it does not scar as much as a plastic cutting board. Using a plastic cutting board over and again gives it scars on the surface. It means that you are likely to get plastic in your food. That further increases chances of stomach infections. It is therefore clear that a wooden cutting board is much wiser option to choose when selecting a cutting board for your kitchen considering it's benefits over plastic cutting boards.